When Coventry dinnerware is referred to, it can often make you wonder whether it is a manufacturer of dinnerware, a dinnerware brand or a type of dinnerware made in the city of Coventry. My first thought would be a dinnerware manufacturer, but that would be incorrect. There are a few dinnerware companies that use the word "coventry" in their pattern name, and a few dinnerware manufacturers that have used it as trademark. To top off the confusion, there are also many places that are referred to as Coventry, including an ancient city in England, and cities or towns in Connecticut, New York, Ohio, Pennsylvania, Rhode Island, and Vermont. Here is some information to help you find the Conventry Dinnerware that you desire. Probably the most recognized distributor of dinnerware referred to Coventry is PTS America. They offer a line of dinnerware under the Coventry brand name. They are also the manufacturer of the 222 Fifth dinnerware brand. 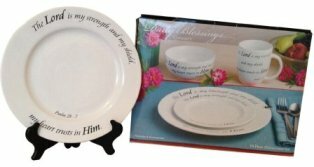 PTS has produced many popular dinnerware patterns under the Coventry brand name. Mikasa produced a Coventry pattern in dinnerware and glassware, and the Coventry Garden pattern. Both featured floral patterns that were very attractive, but somewhat casual. Noritake once distributed a porcelain dinnerware pattern by the name Coventry. The pattern featured gold filigree on a bluish, green band. The pattern has been discontinued, but it is available if you are willing to shop around. Royal Doulton, a popular producer of English china, produced a Coventry pattern that featured leaves with gold accents and trim on bone china. I have seen this pattern in navy blue, green and turquoise. It is a unique and delightful pattern. Another Coventry pattern was made available by Royal Worcester. Royal Worcester is a British brand of dinnerware that is well known for distributing fancy, porcelain fine china, also known as English dinnerware. The Royal Worchester Coventry pattern is simply extravagant with a thick, gold band on white porcelain. These are just a few of the dinnerware manufacturers that produce or did produce dinnerware that can be referred to as Coventry. There are many more, including manufacturers of Japanese dinnerware and many importers and exporters. PTS presently produces a dinnerware line under the Coventry brand name which features many lovely patterns. My guess is that this is the line of dinnerware that you are looking for when searching for dinnerware under the Coventry brand name.